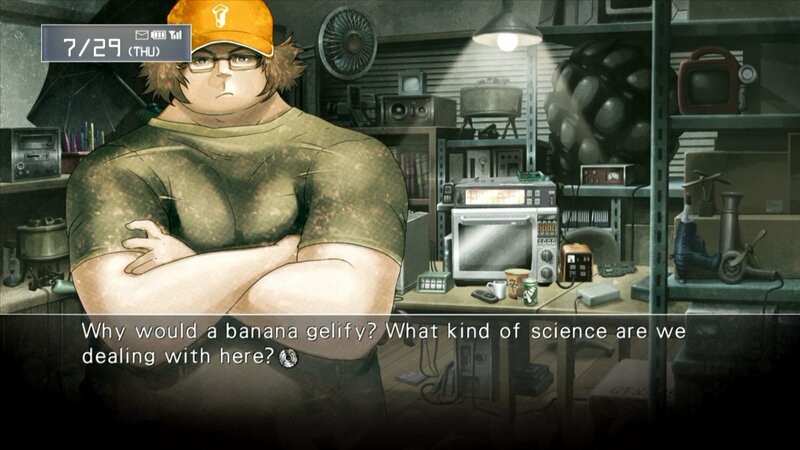 The Gay Gamer: So, who else has pre-ordered the North American PS3 or Vita version of Steins;Gate? So, who else has pre-ordered the North American PS3 or Vita version of Steins;Gate? 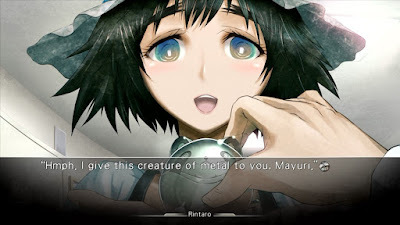 Before we tackle the question posed in this post's headline, let's chat a bit about what Steins;Gate actually is (besides a game with a really strange title, I mean). For starters, it's the second entry in 5pb's and Nitroplus' long-running series of "visual novel" games. Here's an official summary of Steins;Gate's story, in case any of you are curious: a group of teenage scientists discover the ability to alter the past by sending text messages through a modified microwave. Their experiments inevitably spiral out of control as they become entangled in a conspiracy surrounding SERN, the organization behind supposed failed time travel events, and John Titor, a mysterious Internet forum poster claiming to come from a dystopian future. All of the games that are part of this "Space Adventure" franchise have titles with inappropriate punctuation, by the way, with the first entry being Chaos;Head, the third being Robotics;Notes and the fourth being Chaos;Child. Each of these releases have received a multitude of ports (to everything from the Xbox 360 and the PSP to PC and mobile) as well as spin-offs and manga and anime adaptations. Anyway, I've been aware of them for some time now, although I've got to admit that until recently I wasn't entirely sure how they were connected or even if all of them were games. Despite that, I've had the Vita version of Steins;Gate on my lengthy "to buy" list since it was first announced due to the positive comments I've heard about the English PC port that hit North American store shelves last year. Thankfully, it seems I won't have to wait much longer to experience this intriguing sounding and looking title (I especially love its art style, I've got to say), as copies of its North American PS3 and Vita ports can now be pre-ordered via Amazon--with Aug. 31 being their supposed shipping date. If you'd like to pre-order the North American Vita version of Steins;Gate, you can do so here, while the PS3 version can be picked up here. So, who's with me in buying some version of this visual adventure? Do you know if you have to play the others to follow this one? Because I wouldn't mind trying it out. I can’t do a proper search at the moment, Justin, but as far as I can recall (based on earlier research on the subject), you should be able to enjoy Steins;Gate even if you haven’t experienced the other games (or manga, or anime) in the series. If I remember, I’ll do some additional digging in this regard tonight and let you know if the answer is anything different than what I just said. Are you thinking of picking up the PC version or the PS3 version, by the way? I'd probably get the PC version, because I'm sure it's more likely to go on sale there rather than in the PlayStation Store. Besides...the PS3 PlayStation Store is crap. Flaming, stinking, rage-inducing, puppy-punching, awful crap. Oh, yes, get back yo it ASAP, Ken--and be sure to finish it. It's sooooooo good! I played through most of the endings of the PC version and liked it enough to buy on Vita with the UK release and I haven't played or watched any of the others. I don't think there are English language versions of them anyway! Yes, I believe you're right about none of the other games being released outside of Japan, finchie! Well, you certainly can say it more these days than you could in the past, right?